Very close to Seward, in Prince William Sound, Alaska, on Good Friday March 28, 1964 took place the largest earthquake recorded in North America. The magnitude of the earthquake reached 9.2. The earthquake caused a tsunamis more than 200 feet (60 meters) hight. Tsunamis reached Oregon and California causing fatalities. Despite a large magnitude of the earthquake only 131 people died, mostly as victims of the tsunamis. The largest damage was caused in Anchorage as a direct result of the earthquake. Other areas damage was mostly caused by tsunamis. The strength of the Alaskan earthquake has been noticed worldwide and as a result even level of wells in Africa has changed and boats sunk in Luisiana. The great Alaskan Earthquake is worldwide second largest earthquake ever recorded. Only the Great Chilean Earthquake that stroked in 1960 was larger and reached 9.5 on the magnitude scale. On the map above the epicentrum of the Great Alaskan Earthquake is marked in green, in blue we marked Anchorage and Seward. Althout only 131 people died in the Great Alaskan Earthquake, large region suffered great damage. Anchorage suffered the most damage. About 30 blocks of commercial buildings in downtown Anchorage were heavily damaged. Smaller coastal towns, like Seward, suffered also great damage caused mainly by tsunamis. After the earthquake plans of towns were adjusted and new buildings or constructions have been put new more save areas. Damage in Alaska has been estimated at 2 billion dollars (at todays value). Results of the tsunamis are still visible as a death forest that is nowadays preserved. Salty water brought inland by tsunamis destroyed trees in large coastal area. Alaska as one of the most seismically active region on the planet is at constant earthquake and tsunami hazard. Most of the earthquakes and vulcano eruptions do not cause big damage since the most active region of the Ring of Fire is sparsly populated. However, the southern Alaska is not only in danger of tsunamis and earthquakes caused in the region. 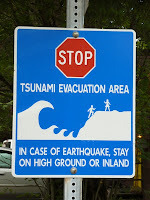 As an coast open to the Pacific Ocean, it is in the tsunami hazard area of more distant earthquakes like those in Japan, Hawai, California or South America. The tsunami hazard zone, the evacuation route and area are well marked in all tsunami hazard areas. 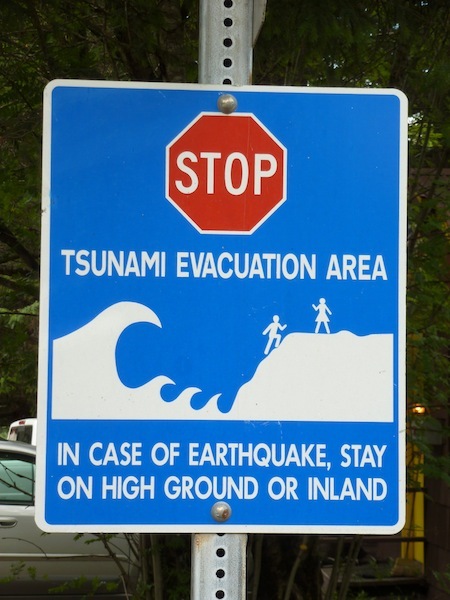 Seward in Alaska has daily test of the tsunami alert, similar to other towns in the hazard zones. Below we show road signs used in Alaska for the hazard area. Tsunami hazard zone US road sign. Evacuation route, road sign from Alaska. Evacuation area for tsunami hazard, Alaska.